We are manufacturer and exporter all types of Wedding Stage Backdrop Decoration etc. We are manufacturer and Exporter all Types Wedding Designer Backdrop Curtains and fiber backdrop panel. This Cloth Backdrop Panel Designed and crafted using the finest quality fabric, threads, zari and many more, our professionals create handmade designs on it in the designing process to infuse an eye-catchy look into it. Fiber Carry are made of unbreakable fiber glass. These are self standing and very easy to stand on stages. 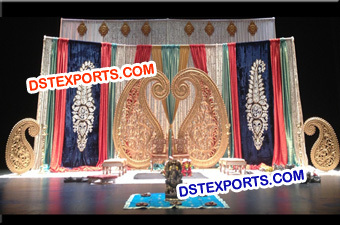 Wedding Fiber Panels Backdrop are very time saving while stage decorations. These fiber backdrops carry will make your wedding stage very beautiful. Fiber backdrop Paisley/ Carry Panels which are very attractive .These are light weighted and self standings.